The Yours Droolley Stainless Steel Ant-Free bowl features a base that is deeper than the outside bottom edge of the bowl, effectively raising the outside rim of the bowl off the ground so ants can't access and climb up the side of the bowl. These stainless steel cat bowls have a patented fused rubber ring along the base rim which makes it anti-skid and rattle free. 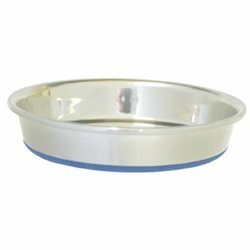 These Stainless Steel Twin Feeding Bowls are available in two sizes and are ideal for cats or small dogs. Stainless steel bowl with an embossed fish on a non-skid rubber ring. 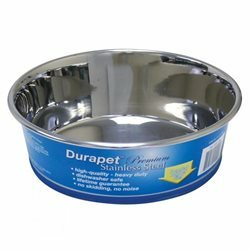 The quality, heavy gauge stainless steel makes DuraPet Premium SS Pet Bowls extremely durable and hygienic, while the weight lends more stability.